When I was a boy, my family went to the Planet Hollywood then recently opened at the Mall of America. The place was covered in TVs (and if you had to compete with Hulk Hogan's Pastamania you would have tons of them too) that instead of playing normal things like sports, played various montages of various film genres. One of them was, of course, "Horror" and featured a clip of Chucky, the murderous doll from Child's Play menacing somebody. For one reason or another, I was terrified, and developed a long-term fear of dolls in general and Chucky in particular. Today, I face that fear. 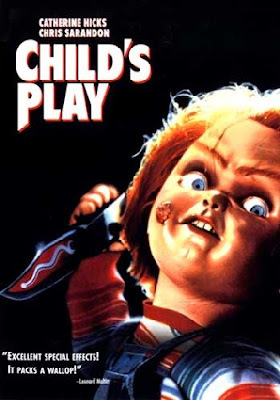 You know the story of Child's Play already: a serial killer (Brad Dourif!) is being chased by the cops. Upon being mortally wounded in a toy store, he uses some voodoo hoodoo that one does to transfer his soul into that of a doll, "Chucky" (accompanied by a gigantic bolt of lightning and a huge explosion). A single mother (the mom from Seventh Heaven) buys this doll and gives it to her son for his birthday. Soon, Chucky is murdering people and it's anything but child's play! Child's Play has a real tone problem. It's not quite a horror comedy because it isn't that funny, but it isn't quite dark enough to make it seem like it's trying not to be one. Maybe it's just the fact that this story involves an evil doll with Wormtongue's voice that makes it too silly to take seriously. One stand up comedian or another once posited the query that a killer doll isn't really scary because you could always punt it. And having your protagonist be a six-year-old (who isn't the Antichrist) really makes it hard to convince the audience that anything that bad could ever happen (this isn't The Shining, after all). Chucky's potty mouth is pretty amusing but it isn't enough to distract me from how un-intimidating a knife-wielding midget (Editor's note: "knife-wielding little person") is. But was it scary? My childhood fears were all for naught. Your typical slasher film scares here, but none that frightening as they're all coming from a Cabbage Patch Kid.